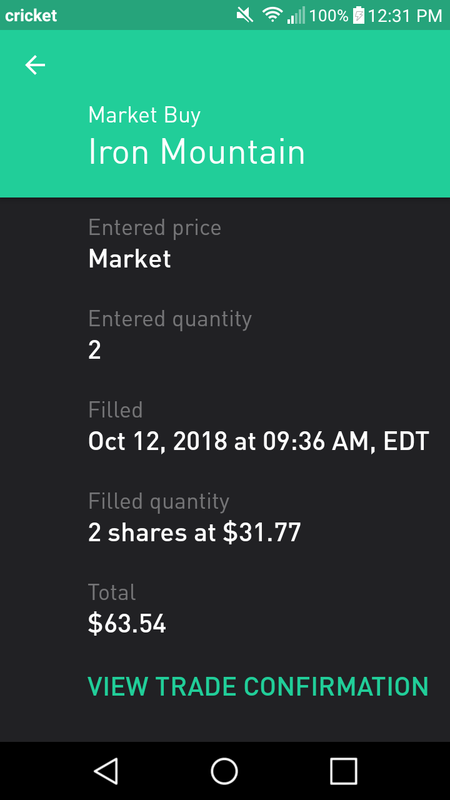 It was about 3 weeks ago that I last added another share of AT&T (T) to my portfolio. 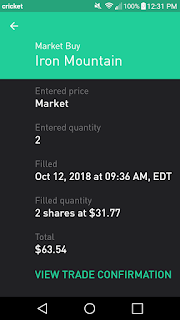 If anyone has checked my Portfolio page recently, they would have possibly noticed that I recently initiated a position into Iron Mountain Inc (IRM). IRM has been quite a popular stock in the DGI community as of late with Dividend Diplomats and Dividend Sensei of SeekingAlpha recently mentioning them. With that said, I'll discuss a few reasons into my decision to initiate a position in this REIT. Iron Mountain is the largest physical records storage provider in the world. The core business of physical records management accounts for 63% of revenue. IRM serves over 225,000 customers in 53 countries on all 6 of the inhabited continents through its 1400 storage facilities. I was delighted to learn that IRM's clientele includes 95% of global Fortune 1000 companies. It is this kind of positioning among many of the largest and most powerful corporations on the planet that gives IRM a strong competitive advantage over its competitors. Because of the necessity of record management in today's information driven business environment, IRM has an incredibly stable cash flow with annual customer retention rates of 98%. According to Eric Compton of Morningstar, monthly storage prices are roughly 19 times cheaper than storage retrieval prices. This gives the 225,000 customers of IRM strong incentive to continue to store their records rather than remove them from storage, and explains the strong customer retention rates. IRM is expanding its presence into data centers, which supports the incredible growth in cloud computing. IRM's data centers are situated in some of the top tech hotspots in the world such as Singapore, London, and New York City, with 90% occupancy and average remaining leases of nearly 3.5 years. Management expects that by 2020, its rapidly growing data center business will account for 10% of operating cash flows. With my entry yield into IRM being 7.4%, IRM doesn't even have to grow very much to be an attractive long-term investment. My entry yield of 7.4% compares very favorably to the 5 year average yield of 5.9%. Of course, a dividend yield can't solely be the basis of an investment decision unless one believes that the dividend is safe. IRM's adjusted funds from operations payout ratio currently sits at a reasonable 81%, with expected AFFO/share growth of 5% through 2019 and nearly quadruple that growth in 2020, that will reduce the AFFO payout ratio to around 73% as the company's multitude of growth projects are completed. This growth in the AFFO/share should lead to 4% dividend growth over the next couple years. The concern in the near term with IRM is its junk bond rating. With an interest coverage ratio of 3.6 and debt to EBITDA of 5.6, the company's IC ratio is slightly better than the sector average of 3.5 while the company's debt to EBITDA ratio is slightly better than the sector average of 6.0. With management planning to reduce its long term leverage ratio to only 4.75, it is reasonable to assume that IRM will receive a credit upgrade in the next few years though. The initiation of a position of 2 shares in IRM has increased my forward annual dividends by $4.70, with a very strong starting yield that is expected to at least keep pace with inflation. The primary risk of buying IRM currently lies in the concerns that investors have over long-term interest rates spiking higher. Rather than delve into this into further detail, I'll leave the link to Dividend Sensei's recent article on IRM as he does a fantastic job of providing an in-depth analysis of IRM that served as part of my motivation to initiate this position in IRM. What recent purchases have you made? Do you have a position in IRM? If not, do you expect to initiate a position in IRM at some point? Nice pickup. A few have picked this company up. I ever tell you i love reits? Thanks for the comment, D&H! IRM has been quite a popular dividend stock in the community as of late.